Congress is considering legislation that would bar the Obama administration from moving forward on a cash payment to Iran of $1.7 billion in taxpayer funds, according to a copy of the legislation provided to the Washington Free Beacon. Obama administration officials confirmed to the Free Beacon earlier Thursday that it is using a taxpayer-funded account to pay Iran $1.7 billion as part of a settlement agreement reached with the Islamic Republic ahead of the release of five imprisoned Americans. Critics of the agreement allege that the administration agreed to the payment to spur Iran to release the five Americans, who were freed over the weekend. 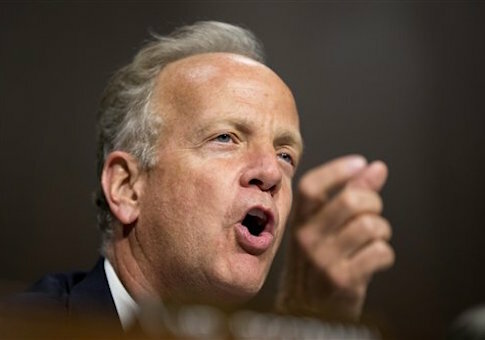 The news has sparked outrage on Capitol Hill and prompted Sen. Jerry Moran (R., Kan.) to file legislation Thursday afternoon that would bar the administration from moving forward on the payment until Iran pays millions in judgments awarded to the U.S. victims of its global terrorist network, according to the bill. "The United States should not be funding governments that openly violate human rights, proudly disregard U.N. Security Council resolutions, and call for the destruction of America and its allies," Moran said in a statement. "This bill directs the U.S. government to put justice for American victims of Iranian terrorism ahead of compensation for the Iranian regime." "Rather than incentivize state-sponsored kidnapping, the administration should remind the government of Iran that terror and hostage taking are not for-profit enterprises," Moran said. The bill would "prohibit the use of funds to make payments to Iran relating to the settlement of claims brought before the Iran-United States Claims Tribunal." The legislation prevents federal funds from being used to make good on this payment, which is likely to spark anger in Tehran. The money will only be made available once "the President certifies to Congress that the Government of Iran has paid all compensatory damages awarded to a United States person in a final judgment" against Iran for past acts of terrorism committed against U.S. citizens. The new settlement with Iran was reached independently from the recently implemented nuclear deal and is separate from the $150 billion in unfrozen cash assets the United States is obligated to give to the Islamic Republic under the agreement. Obama administration officials maintain that the settlement was not tied to the release of Americans, though Iranian officials have said this statement is untrue. The $1.7 billion settlement is "not related to the [Joint Comprehensive Plan of Agreement] or to the release of the U.S. citizens from Iran," a State Department official who was not authorized to speak on record told the Free Beacon. "The claim that was settled is part of a much larger case involving Iran’s claims arising out of the former Foreign Military Sales program Iran had with the United States in the 1970s," the official said. This is likely the first settlement of many, according to the administration. "A large number of claims remain to be resolved at the Claims Tribunal, and this settlement regarding the Trust Fund is one in a series of claims settlements we have been discussing over the last two years," the official said.